You have found the perfect Northern Michigan log home for your vacation with this beautifully crafted, spacious log home with majestic views overlooking the 8th green and fairway of the Hawk’s Eye Golf Course; rated as one of Michigan’s Best golf courses you can play. 10 mile views from each level will take your breath away. After entering this dramatic two-story home, you’ll walk into the sunny living and dining areas featuring wood floors, soaring ceilings and wood paneled walls all centered by a beautiful natural stone fireplace; truly a beautiful home. The open kitchen is modern and well equipped with gorgeous granite counters, custom rustic cabinets, GE Profile stainless appliances and an island with a snack bar. The main floor also features two bedrooms and a full bath. 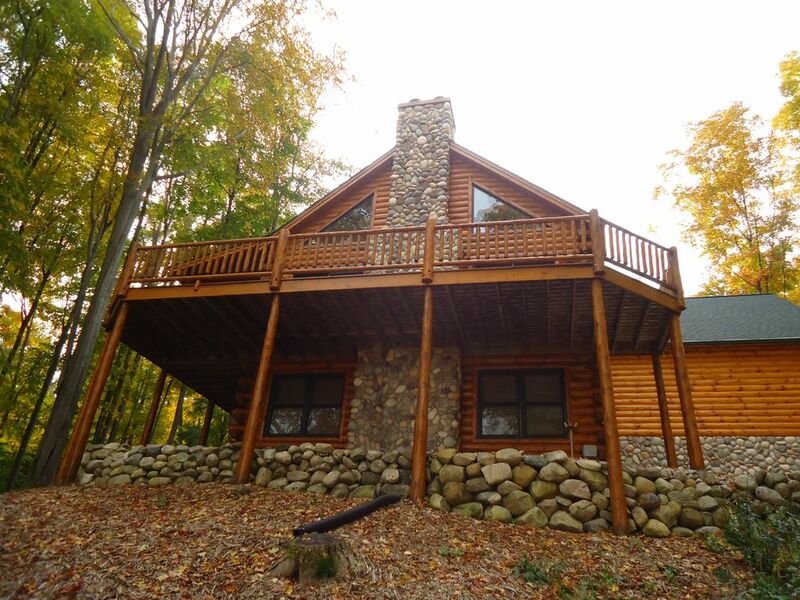 The home is outfitted with custom built log furniture, leather couches, flat screen TVs, laundry facilities and more. Just unpack your bags and enjoy spectacular golf, along with nearby skiing, pools and the finest lakes in the state. 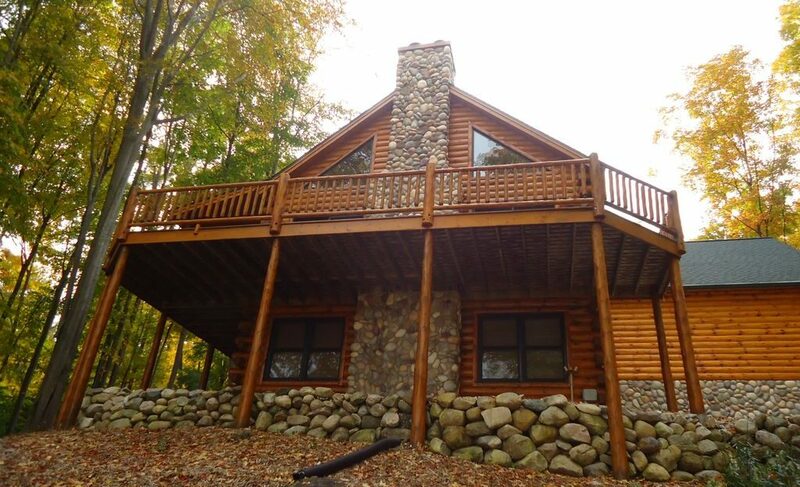 The upper level has a luxurious Master Bedroom with a queen log bed, private bath and flat screen TV. 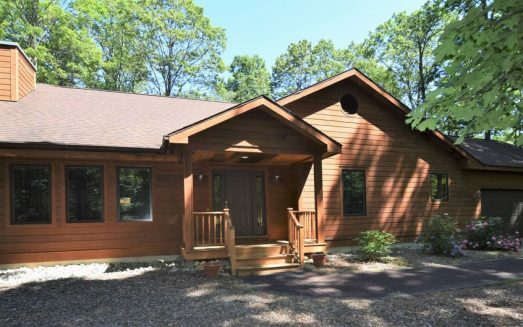 The walk-out lower level offers a generous family room area, with a wet bar, full bath and stone fireplace. With large groups, you will appreciate the added living space for activities and multiple TV watching opportunities. The home has been wired with surround sound on the main floor and lower levels and stereo in the master suite. 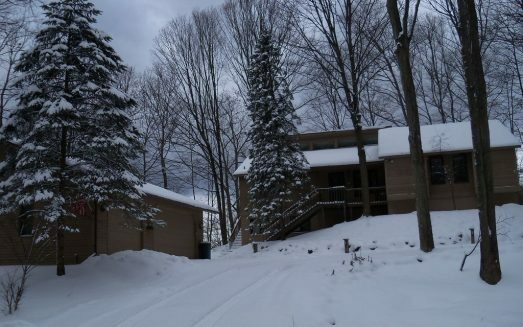 Centrally located to Traverse City, Petoskey, Charlevoix, Torch Lake, and the best skiing and “up north” golf with 6 courses within a mile. 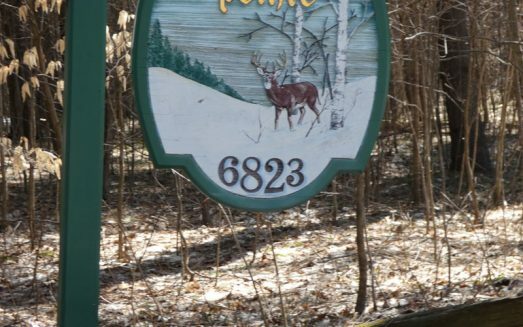 Feel like a local and enjoy all this custom home offers with lots of nearby and day trip activities including winery tours, hiking, mountain biking, skiing of all kinds, fishing or simple relaxation while grilling on the fabulous deck. Boat rentals are nearby, including power boats, personal watercraft, canoes and kayaks.